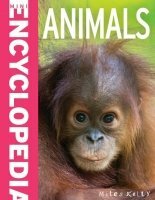 This amazing animal encyclopedia for kids is small enough to slot into school bags, making this a fantastic resource for school projects and homework at key stage 2. The ultimate animal encyclopedia for kids, Mini Encyclopedia Animals is a compact, comprehensive children's encyclopedia that uses clear, bulleted facts and incredible info panels to explain everything from how animals live to different animal groups. Every topic is supported by photographs, realistic artwork and detailed diagrams, and colour-coded sections make navigation through the topics easy and quick. Chapters and topic examples of Mini Encyclopedia Animals: • How animals live: Habitats, Senses, Nutrition, Life cycles and Animals in Danger • Mammals: What are mammals?, Egg-laying mammals, Tigers, Chimpanzees, and Dolphins and porpoises • Birds: What are birds?, Flightless birds, Emperor penguins, Birds of Prey, and Parrots and cockatoos • Reptiles: What are reptiles?, Lizards, Geckos, Snakes, and Turtles and tortoises • Amphibians: What are amphibians?, Newts and salamanders, Toads, Frogs, and Poison arrow frogs • Fish: What are fish?, Coral reef fish, Freshwater fish, Skates and rays, and Great White Sharks • Invertebrates: What are invertebrates?, Corals and anemones, Crustaceans, Arachnids, and Insects Amazing facts for kids to learn include: • Mountain gorilla numbers fell below 1000 after many years of being hunted by humans. They still face an uncertain future. • Giraffe tongues are so tough that they can wrap them around the thorns of thorn trees to grab twigs. • Dolphins can see equally well underwater and in air, unlike most other animals, though they do not see in colour.